GLENDALE, Calif., Nov. 13, 2017 /PRNewswire/ -- Applebee's Neighborhood Grill + Bar® unveils a brand-new addition to its lineup of innovative menu offerings – a series of Topped Steaks & Twisted Potatoes –starting at just $12.99. 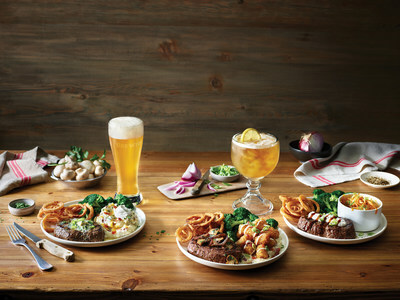 The classic combination of steak and potatoes is a fan favorite and Applebee's is giving guests all the power to add their own savory twist by selecting a choice of steak, delicious toppers and a twisted potato side. "At Applebee's we are always looking for ways to bring our guests the food they love and crave, and present it in a way they've never experienced," said Stephen Bulgarelli, chief culinary officer, Applebee's. "The customization and flavor options of the Topped Steaks & Twisted Potatoes allow our guests to choose a dependable flavor, while enjoying it in a way that is completely new and unexpected at their local restaurant." For more information on the latest new menu offerings and deals from Applebee's, check out the online restaurant menu and stop by your neighborhood Applebee's. *Selection may vary at participating restaurants.